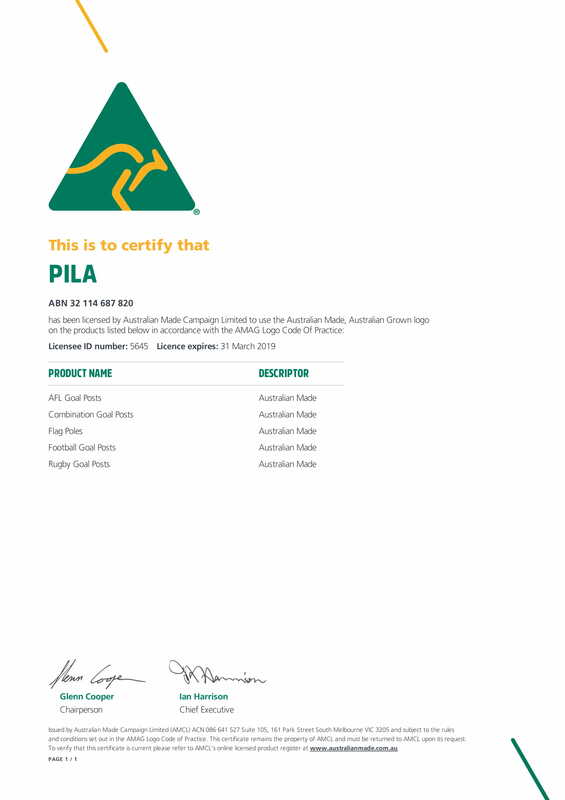 PILA is a Certified Australian Made Manufacturer with License #5645. We are proud to manufacture all of our products in Australia and we support skills of local fabricators by producing our aluminium products on-site. We employ Australians from all backgrounds. Our employees are your neighbours, your friends and your family. It’s simple, we all gain employment from Australian Made. Every dollar spent by us is primarily spent in our local economy from electricity business costs, to buying supplies from other local businesses. We try to source Australian goods when purchasing to support fellow business operators. Being based in Australia allows us to take on and train Australian citizens that are unable to get jobs elsewhere due to skill sets and these are the jobs that are moving overseas. We also are able to support local groups in their endeavours including sponsoring local sports teams and providing giveaways to schools, not-for-profits and charitable organisations. As we follow strict OH&S legislation in Australia, every employee should be safe and secure when working in our manufacturing facilities. We provide a clean and healthy workplace and our employees are able live comfortably off the wage they earn. When you buy from overseas, we don’t know the type of conditions that their employees are exposed to. Because we manufacture in Australia, we know and can prove what is going into our products. We can vouch 100% for the quality of our products. With every claim we make, we can support it because it’s made on-site – we see it. We don’t have to wait for an order to arrive from overseas to check the quality. Remember every dollar you spend on an Australian Made and Owned product reaches a lot further than just the amount spent. It reaches you – the Australian citizen, the beneficiary of the Australian tax dollar. Manufacturing in Australia is widely seen to be declining however we work hard every day to ensure our industry is not diminishing but rather evolving with changing consumer needs and greater value towards high-quality niche products. As the industry continues to develop towards being known for quality and service, the importance of understanding where your products are made is becoming more evident, particularly within an area as specific as sports products. When specifically looking at sports equipment manufacturers Australia wide, there should be a high level of quality control that goes into the production line. For an industry that manufactures products used by most Australian school aged children, this quality becomes paramount. The ability to pass Australian Standards testing is far more likely when dealing with a local manufacturer that has already abided by material safety requirements and has specifics on hand. As the aluminium manufacturing industry continues to develop with the Australian trend towards high-quality niche products, make sure that you support local manufacturers for your sports equipment needs.